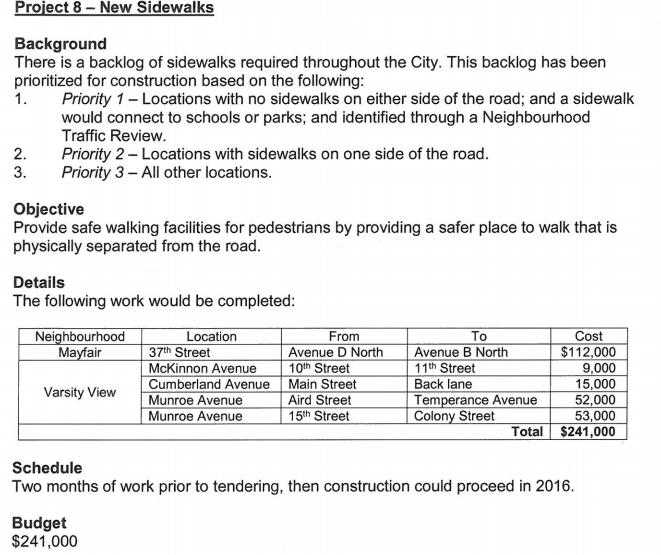 Sidewalk Infill and other Pedestrian Improvements get a Little Election Year Funding. Some good news on funding of sidewalk infill from City Council’s Standing Committee on Transportation from the last two meetings: council has proposed allocating just over a million additional dollars to Active Pedestrian Controlled lights, sidewalk infill construction and other city walkability improvements. Being an election year (thinking cynically), the councilors decided to raid the Traffic Safety Reserve fund (money from traffic cameras) to increase already existing funding to smaller pedestrian improvements such as crosswalks and curb extensions as well as allocating some money to the capital budget item for building sidewalk infill. The list of sidewalks to build is taken from a ‘priority list’ generated from Neighbourhood Traffic Reviews where at least the first priority is given to streets that are adjacent to schools and parks. How that priority list is further refined into the streets and neighbourhoods that got funded projects this year is not clear and probably involves some political calculus. Varsity View and Mayfair/Kelsey-Woodlawn had many requests approved and Haultain had none, for example. 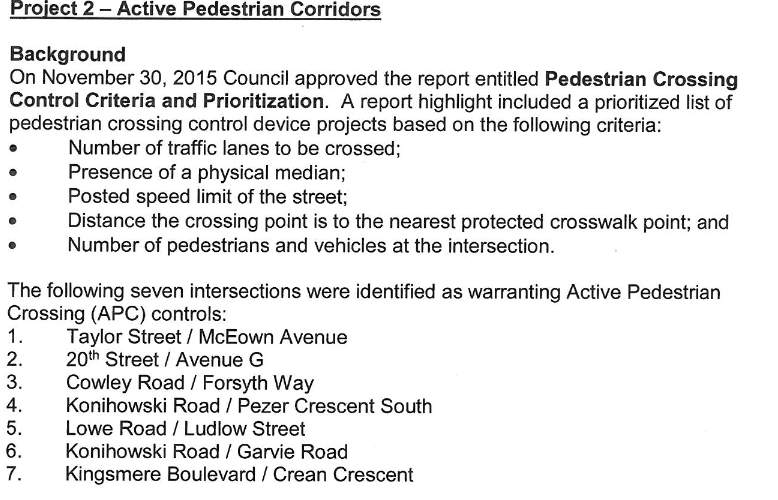 It’s also not clear how this sidewalk infill priority list will differ from the sidewalk infill priority list contained within the yet-to-be-adopted Active Transportation Plan. Another issue with generating the list from Neighbourhood Traffic Reviews is that many areas have not had their reviews performed, making the infill list incomplete, and heavily biasing the improvement funding towards neighbourhoods that had their reviews earliest. Priority lists of any sort are somewhat moot at this point in any case. Council has used all normally budgeted money for 2016 and 2017 as well as the one-time build-up from the Traffic Safety Fund to fund the listed work. 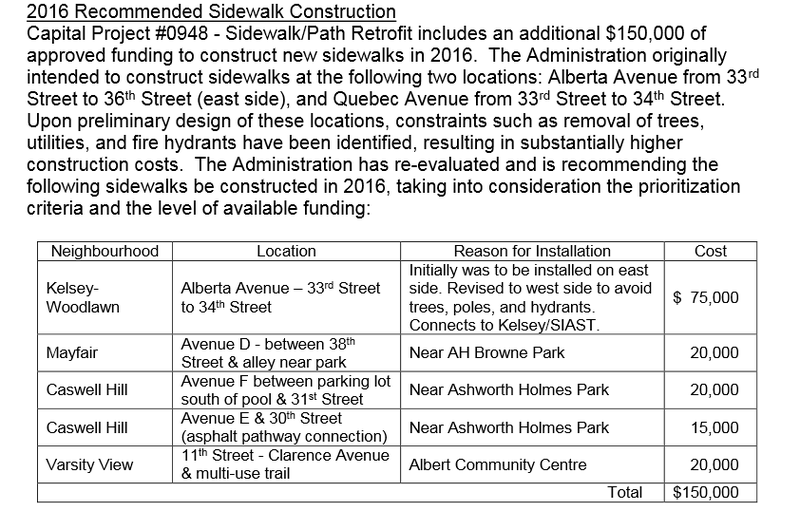 In addition, earlier in the year there was $150,000 taken from the Active Transportation implementation fund allocated for sidewalk infill already in the budget (see below for list of projects) but it’s unclear if that money is budgeted in the future. Sidewalk infill needs are estimated to cost $4.2 Million 2016 dollars, and that’s just for the neighborhoods that have had traffic reviews. The real figure is probably twice as high. At $150,000 per year in the best case the holes in the walking network will take a long time to fill. Already approved sidewalk infill in 2016. However, it’s nice to talk about funded pedestrian improvements, hopefully this will be the first of many such announcements in the coming years.